There is a little room at the bottom of my house, underneath my living areas, built into the gentle slope of the land. It doesn’t communicate with any of the other rooms; you can only access it by going out of the house and around to the back, preferably armed with the key. It has bare concrete walls covered in crumbling plaster. The low, plasterboard ceiling is buckled from eighty years of people walking above it, and there are holes from where nails have been hammered into the floorboards. It is partially underground, so the bottom few inches of the walls are damp and crumbling, and when it rains, which it does a lot in my valley, water seeps in under the door. I bought the house without seeing the inside of this room, which has been locked up for the ten years in which it was a rental, and so it is also musty, with spiders and millipedes festooning the corners. There was once electric wiring to this room; now, a snipped wire dangles from the centre of the ceiling. There is a single power point in one corner that dates back to the 1940s. 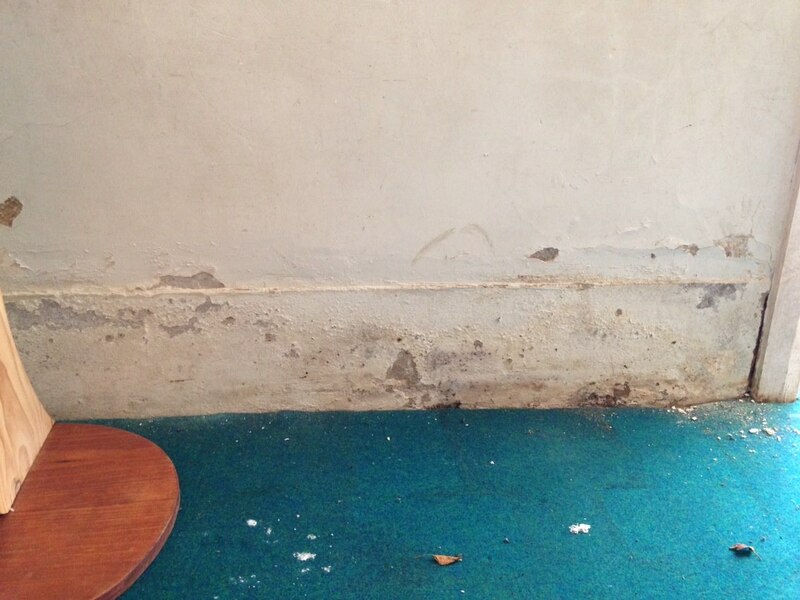 The carpet is cheap, synthetic and bright blue, with mould spores and lumps of plaster that have fallen out of the walls. A single window, in a rusty iron frame, barely opens. This is an unloved room. It is too small to be a guest room, and too far away from the amenities of the house. But it is private, and secret, and it is mine. I spent most of my Sunday ripping down the cork board, chipping away the worst of the crumbling plaster to create ever-bigger holes in the walls, and sweeping up millipedes. And then trowelling masses of new plaster into the smaller holes, and the ceiling, until my hands, clothes and toddler were covered in white dust, because of course this job is being done with a helpful toddler in tow. What has any of this to do with sobriety? Not much. But this blog is called And Everything Afterwards, and in this new, beautiful Afterwards I am going to have a room. ← Playing the film to the end. The actual end. In my drinking days I used to have a repetitive dream of finding a room in my house that I never knew existed. a room squeezed between walls, with a door behind layers of wallpaper. I had put this down to my hausfrau appetite for more living space. it is only on reading your post that I realise that firstly, I don’t dream that dream any more, and secondly, that the dream was about finding room in my life for myself. thanks for this. I am so glad you have your room, blue carpet and all! How very Charlotte Perkins Gilman of you, Primrose! I’m glad you’re free of the dream. Right, but – brilliant, yes? Love it. Happily getting plastered. OH, finding a room of your own! Brilliant. Primrose, wow, I’ve had that repetitive dream too!! Open a closet door and there’s a whole room I didn’t know existed. I always thought it was my quest for more living space. Maybe it was my search for ME? Love the idea o f a room of your own. Ooooo…this is going to be exciting!!! Can’t wait to see the pictures! Excellent. This is the exciting part about getting sober…all the discoveries and accomplishments we probably wouldn’t have or do otherwise. Love it!